There were two significant changes this time around. The reworked "Community" section now remembers which community you like to track, and will retain that choice each time you launch the app, or until you change it from the dropdown menu. Also, the app widget will only show content from that community (and will update that content if you turn on AutoSync via "Settings"). Note that options for posting, searching, and refresh are still there, but may be accessed differently based on orientation and your type of device (see the attached image). The second change relates to the TaskStream link (under "Direct"). Selecting this link will now let you choose how to open TS. 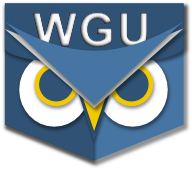 You may open it within PocketWGU, or by using any web browser installed on your device. If you open it inside PocketWGU, you may be prompted to click a link to "continue to the Taskstream web site". In our experience, this still works.